OUR literary editor Illtyd Harrington was enjoying a spot of classical music at his London home on Friday morning when the phone rang. It was none other than his old pal Daniel Craig, the bristling star of the latest Bond blockbuster Casino Royale, who first met Illtyd as a young actor with the National Youth Theatre during the 1970s. Illtyd was a board member at the time and Mr Craig was keen to take a trip down memory lane at a restaurant near his his home in Woburn Village, Bucks. Mutual friend Kevin Whately, who played Sgt Lewis alongside John Thaw in the Inspector Morse series, and was also on the NYT’s books, was a fellow diner. 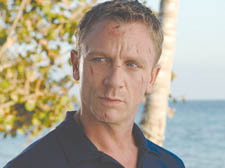 “He drank good red wine and ate roast beef of old England as his main – quite befitting a James Bond,” says Illtyd. The trio rounded the meal off with a portion of Christmas pudding topped with lashings of brandy butter. Wary that superstars often “strut about and lose contact with reality”, Illtyd asked Craig about his latest film The Golden Compass, adapted from the first book in Philip Pullman’s trilogy His Dark Materials. “Dan said that in the United States,” recalled Illtyd, “the League of Decency – a ter­rible group of Roman Catholics who can stop a film very easily – thought the Compass was atheistic and were about to come out against it. What they didn’t realise was that the same day they voted against the film there was a conference of Roman Catholic bishops who said the total opposite. I TOOK a weekend saunter along Flask Walk in Hampstead recently looking for Christmas presents, and despite the regrettable demise of Steeles butchers I was struck by the magic the Walk still possesses. Years ago I regularly shopped in the Walk when I lived nearby in Willow Road. Perhaps I was in a nostalgic mood, but something about the Walk got to me. I gather a very good Klezmer band appear in the mornings and busk, while the fine artist A L Koetsier can often be found on the corner by the Flask pub with his easel, recording the day’s events. I am a regular in the bookshop there, once owned by the novelist Joseph Connolly. He wrote a tribute to the street for the autumn edition of the Flask Walk Association’s newsletter, which I found pinned up on a noticeboard opposite his old shop, and it echoes my thoughts. Joseph said: “There was a ­bookshop at number six since the 1950s and maybe even before the war. It was the property of a ­certain Mr Fry. “I bought the lease from the much-loved white haired old ­couple Peggy and Jasper Waterhouse – a brother and sister – and they used to have bookshop in Swiss Cottage. “Once I got it going again with first editions, art books, antiquarian and literature, on Saturdays people would have to wait outside until there was room for them to squeeze in. “This was a time when there were seven bookshops in the ­village alone. My best customers tended to be doctors, lawyers and actors (Peter O’Toole, Jeremy Irons and Peggy Ashcroft. One day after a bilious lunch and ­giggling in came John Cleese, Michael Palin and Terry Gilliam), and happy clever penniless folk who loved books. “There were not a lot of writers – John Le Carré and Melvyn Bragg would walk past three or four times a week and in 14 years never once came in. “Kingsley Amis did, though – we had some jolly lunches at the Flask and some jolly evenings at his house down the road. I recall cringingly my five-year-old daughter Victoria told Michael Foot off because his dog Dizzy was making muddy footprints all over the floor. non-fiction books and did a lot of freelance journalism, mainly for The Times. I couldn’t agree more, although with the closure of dear old ­Steeles, I cannot help but feel worried for the future of this ­village gem. THE other day I got chatting to a man-of-the-street whom I meet from time to time. I don’t know much about him except he lives on the Regent’s Park estate. A tall, stooped figure, he seems to spend most days wandering around the streets of Camden Town. I first met him several years ago in the com­pany of John Bird, founder of the Big Issue. With Christmas almost on us, I thought of ­inviting him home for a family meal. “What are you doing for Christmas?”, I asked. “I might go to Brussells or Amsterdam,” he said. I suppose someone like my friend, who knows how to draw his rightful benefits, could have a bit of spare cash to splash out on the occasional holiday. And why not? But it’s all a far cry from the usual image we form of people on benefit. I RAN into folk singer Bob Davenport the other day and discovered he is gearing up to perform at the Old Queens Head in Essex Road, Islington at the beginning of February. One of the stars of the folk scene since the 1960s, Bob, who lives in Bloomsbury and is 75, remains in heavy demand. He has the deepest and loudest – musically speaking – voice, I have ever heard. Once, he performed at the Albert Hall and sang to an audience of 2,000 without a microphone. I missed that concert but friends who caught him that night said his voice rang out clearly and sweetly. Chatting to Bob prompted me to listen to a CD he made a couple of years ago and with Christmas spirit washing around me, I couldn’t get out of my head one of his own songs with a haunting tune called Wild, Wild Whiskey. He admitted he was inspired by a Buddy Guy blues number of the same name. In this festive period, when it is time to think of those less fortunate than ourselves, his tale of the demon drink resonates.